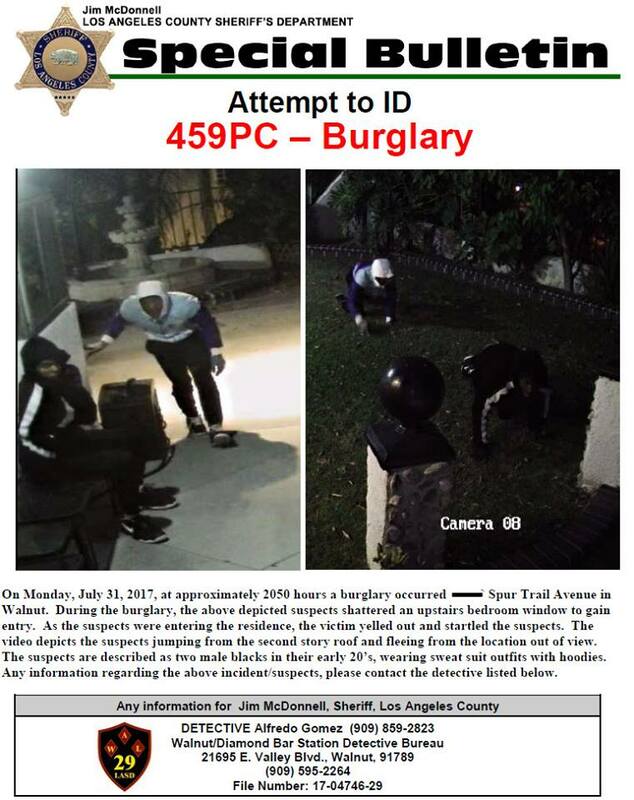 Walnut – It was approximately 8:50 pm on a Monday on Spur Trail Avenue in Walnut when a burglary occurred. The sound of shattering glass came from somewhere upstairs. Somebody was breaking in the yelled out so they knew somebody was home, the suspects were startled and jumped from the second story roof fleeing from the location and out of view. Sergeant Dail of the Walnut/Diamond Bar Station Detective Bureau was contacted and said that “nobody has been arrested at this time”. During the investigation a video was obtained and these pictures have now been released. Sergeant Dail said, “we are releasing these pictures because we are looking for help to ID these suspects”. The suspects are described as two male blacks in their early 20’s, they were wearing sweat suit outfits with hoodies. California Penal Code 459 PC (burglary) is a felony and the potential consequences include a sentence of two, four or six year prison terms. Penal Code 459 PC reads “Every person who enters any house, room, apartment, tenement, shop, warehouse, store, mill, barn, stable, outhouse or other building, tent, vessel …with intent to commit grand or petit larceny or any felony is guilty of burglary. 2.2. What are the penalties for second-degree robbery in California? « Why Live In Diamond Bar?